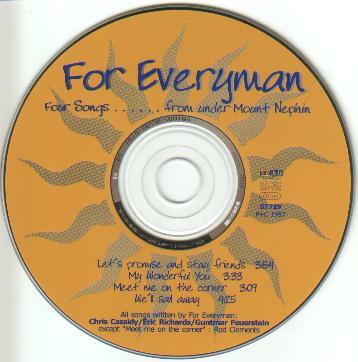 Chris Cassidy : vocals, Eric Richards : piano, bass & guitars, Guntmar Feuerstein : guitars, mandolin, percussion & vocals. 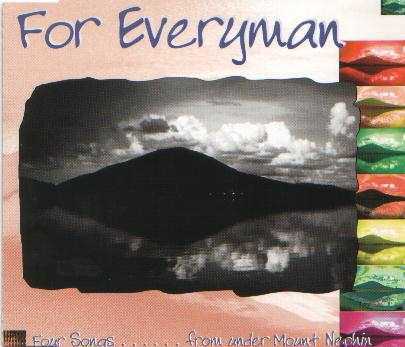 For Everyman's first Maxi CD : " Four Songs....from under Mount Nephin " showcases four songs that demonstrate the preference of the group for clear acoustic arrangements. Virtuoso guitar playing and the unmistakably emotional voice of Chris Cassidy are their trademark. With the Lindisfarne song, " Meet me on the Corner " they pay tribute to their folk roots. The special qualities of the international trio becomes clear in their own compositions: strong hooklines with " Wonderful You " and " Let's promise and stay friends ", clear, timeless melodic lines in the lovely ballad." We'll sail away ". This very promising material makes the listener hungry for more. Chris Cassidy, Ireland, singer, self taught, 20 years experience with Irish music. Eric Richards, England 1980-1990 with Dudu Pukwana's Zila. Toured with Gloria Gaynor. From 1993 - 2000 with the John West International Big Band. Guntmar Feuerstein, Germany 1984 -1986 singer and guitarist with the pop band "Die Strandjungs" (Surfen auf´m Baggersee) later guitarist with the legendary soul formation "Raoul Vandetta and the Soulfingers ", also since 1989 together with Fred Ape in " Ape & Feuerstein " on the road. I dont wanna talk about it ............. and a few others too numerous to mention !